Rooftop nightclub venues are hard to come by, especially for an after prom! Seniors, rejoice! Penthouse 760 is here! With it’s sleek decor and high ceilings, you can’t go wrong! Don’t let the end of your prom night experience leave you at someone’s house party in a dark dingy basement. 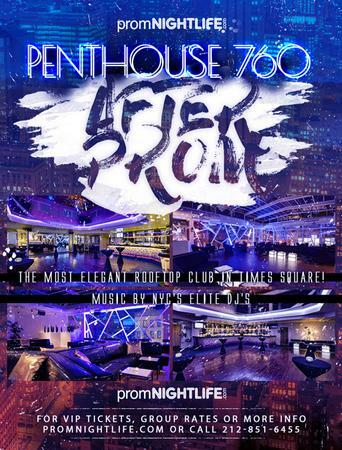 Come alive in the center of the action at the hottest rooftop venue in Times Square – Penthouse 760! With capacity to hold hundreds of clubbers, a retractable open rooftop, and spectacular views looking onto 8th Avenue – Penthouse 760 is a true nightlife gem in Times Square. The rooftop is split into two sections. First, the dance floor which encompasses 50+ foot ceilings and a wrap around bar with LED surface-mounted lighting. Second, the lounge area which has over 15 VIP black leather couches and is surrounded on the perimeter by glass walls, elevating the ambiance of the penthouse feel. We usually open up the retractable glass ceiling when the weather warms up about 70 °F. So when it comes to after proms during the months of May and June, this is the perfect venue to have your after party.